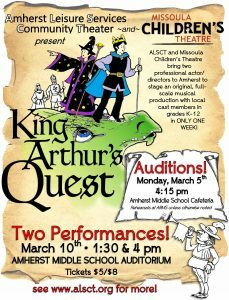 The Missoula Children’s Theatre is once again offering a great audition opportunity for kids from the Amherst Leisure Services Community Theater. This will be a one-week musical theater experience for kids ages K-12. In the past, the children have had a wonderfully immersive theater experience. For more information, visit www.alsct.org.